Business View Magazine interviews Daniele Cagnatel, President & CEO of AIM Aerospace, for our focus on Domestic Manufacturing in the Composites Industry. For 30 years, AIM Aerospace has been designing, testing, and manufacturing composite products for the aerospace industry. 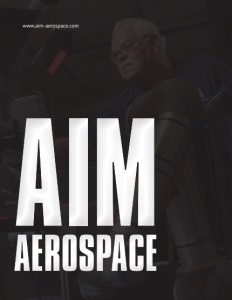 AIM Aerospace’s focus on consistent delivery of high-quality products, and dedication to its customers, has solidified the company’s distinguished reputation for unequaled performance. In 2017, AIM Aerospace acquired Quatro Composites, a supplier of advanced composite structures, components, and assemblies to the aerospace industry. The combined capabilities of these two successful companies provide AIM Aerospace further customer, platform, and geographic diversification, and extended its capabilities into structural composites and thermoplastics, two of the fastest growing areas within the composites sector. Business View Magazine recently spoke with Daniele Cagnatel, President & CEO of AIM Aerospace, who described the evolution of the company as a leader in composite component manufacturing and the exciting role technology will play in the future of the industry. The following is an edited transcript of that conversation. BVM: Congratulations on your one-year anniversary with AIM Aerospace, Daniele. Can you share the backstory of the company? “The company has grown strong with Boeing and the 787 Dreamliner. Over 23 years, AIM Aerospace manufactured all of the 787 environmental control system ducting, from the center box (the wing of the aircraft), all the way to the cabin (the nose); about 25,000 parts every month. In aerospace terms, that is very high volume. BVM: How did the acquisition of Quatro Composites benefit AIM Aerospace? Cagnatel: “Quatro brings a completely different kind of capability. They developed a new type of carbon fiber technology for AIM Aerospace called thermoplastics using a unique process, trademarked QFORGEM. They work with carbon fiber components which are more solid, stronger, and higher tech primary and secondary structural components. If they fail, the aircraft fails. They also work on unmanned aerial vehicles; fuselages and wings for large commercial and military vehicles (aircrafts with 15 to 18-foot wing spans). “One of the key reasons why QFORGE is so important is that it’s a fully-automated system, whereas the work we do in Washington State is very labor intensive. The system also incorporates the latest technology called ‘Industry 4.0’. This technology has taken a strong foothold in Europe and has now become the buzz word in America as well. Industry 4.0 is about connectivity, about automating a manufacturing system to create the repeatability process (that’s Industry 3.0), but then using data and data collection systems to get information out of the automation system and using that information to improve quality and productivity. It is equivalent to going for a run and using a FitBit; you have a graph on your iPhone that shows how fast you run, how far you’ve ran, how many calories you burn, and you use that information to monitor your overall performance to reach your goal. That’s what Industry 4.0 does for the manufacturing system. BVM: What type of company values are part of your growth strategy? Cagnatel: “When I stepped in a year ago, we had two businesses at almost opposite ends of the manufacturing spectrum – very different products, but with so much to offer to complement each other. We discussed a strategy for growth and how to integrate Quatro Composites and AIM Aerospace. The answer we found was to create a new AIM Aerospace where all sites at both companies would merge their talents and capabilities to gain the most value. So, we involved the whole team in choosing what values would drive us in the rebranding of AIM Aerospace. Because, we want to give people something to relate to, not just a job. “When deciding on those values, we put safety first. In 2016, we had 169 recordable incidents within the company to OSHA Standards. In the second half of 2017, when we stepped in as a leadership team and put safety first, bringing down recordable incidents to 111. This year, at the half-way point, we are at 29. Safety was and still is our first and major concern. We also talked a lot about treating people with dignity and respect; about integrity in delivering what we promised to our customers, ourselves, and our shareholders; trust, at all levels – management and workforce as one team. “And we talked about engagement. If you get a thousand people in a company driving towards the same goal, nothing can stop you. Last, but not least, we talked about passion. We dedicate a lot of our time to the company and if we’re not passionate about what we do, if we don’t truly believe in it, we’re wasting our time. We talked about how we would lead using those values and then we talked about the strategy. By doing so, we attracted a phenomenal amount of new talent that is going to take this company to the next level. BVM: What are the biggest challenges you’re facing and how does the future look? Cagnatel: “The life cycle of the aircraft. In the years when we were going through the wrap-up phase of Boeing’s 787 and A350, and the conversion of A320 to NEO and 737 to MAX, those were all new platforms that required collaboration with the supply base to the customer. The customer needs your help, you step up with new technology, with investment, you get on the platforms, and help them manufacturer these new products. Whereas, the life cycle we’re in now, the platforms are steady, they’ve ramped up, and there’s very little going on. Now you’re into a cost phase, where the customer needs to be more competitive in selling their aircraft, and they will try to get the best cost for their part whether it’s local or outsourced internationally. “That’s where you have to compete and, at the same time, grow your company. Not growing is not an option. You have to displace incumbents by being more price competitive. We strive for a middle ground. Our challenge is growing in a very high-cost, high-pressure environment and we need to compete by providing the technology that reduces the price. We want to get into the growing jet engine market with the new platforms. The jet engine supply base needs new composite suppliers because the amount of carbon fiber in an engine today is 10 times as much as it was in previous engines. “Our plan is to increase the volumes, the value and the revenue of our company by 50 percent in the next four years. We wish to grow by about 300 people; the level of employment would increase thanks to new levels of automation. The future of aerospace, in my view, is the fundamental digitalization of the supply chain. Aerospace is still very conservative, and the level of digitalization is very low compared to other industries. A huge amount of overhead is spent because we still do things the old, manual way. Check out this handpicked feature on Impro Industries USA Inc. – A one-stop-shop solution provider.